If you or your practice offers nutritional therapy, Ayurveda or herbal medicine, if you are looking to add another modality to your offering, or are a student in this field, then the NEW Nutrition Theatre and Trail at this year’s camexpo is for you! Sponsored by Revive Active, the timetable hosts speakers including Dr Marilyn Glenville, Dr Alex Richardson, Dr Nina Bailey and many more so make sure you register for your special £7.50 BANT reduced ticket* today and set some time aside for these exciting sessions covering a whole host of hot topics. Welcome to the August issue of BANT News. This month we have received many interesting and unique contributions, making the last of our summer issues positively overflowing with fascinating content and informative articles for our readers. We hope you enjoy this bumper issue! Access the BANT news here. Welcome to the August issue of BANT News. This month we have received many interesting and unique contributions, making the last of our summer issues positively overflowing with fascinating content and informative articles for our readers. We hope you enjoy this bumper issue! to actively and effectively contribute through the Regional meetings, as part of the committees, in strategic workstreams or as directors in Council, and to embed a culture of volunteering that is inspirational, fun, motivating and a learning experience. If you are interested in applying for the role please send a supporting statement and CV to generalmanager@bant.org.uk by 31 August 2015. Defining a ‘nutrient’ better fit for purpose in the age of genomics and metabolomics is now a priority. We need a fuller biological description so that we can ask more questions, for example are there are other substances which should be classified as nutrients or is the concept of a ‘daily allowance’ suitable for all nutrients? Click here to have your say. See the BANT microsite and view recent press releases and articles. 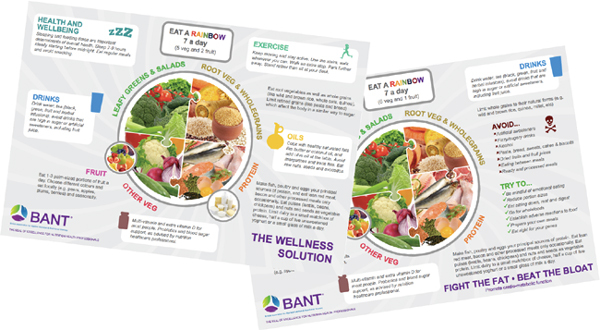 BANT is developing Practitioner Toolkits to help BANT Practitioners communicate nutritional therapy approach and a variety of nutritional and lifestyle topics with one voice. The toolkits will be expanding during the 2017 beyond the current visual tools to aid practitioner communications with clients, other health professionals and the media. BANT Wellbeing Guidelines are evidenced-based guidelines providing information on nutrition and lifestyle measures when personalised advice is not possible.